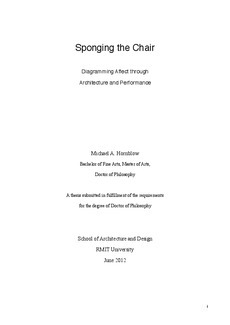 This doctoral research, conducted through both practice-based and theoretical inquiry, is located within the field of psychophysical performance practice, informed by and intersected with philosophical and architectural approaches to diagramming. The aim of the research is to develop ways of approaching and understanding how affectivity emerges and transforms in a particularly diagrammatic manner within a performative event. In particular, this is considered through the experience of an individual person, between people as intersubjective and collective bodies, and within the built environments they occupy. The research begins with the problem of attaining a condition of ‘openness’: a condition whereby performer(s) produce an affective, collectively held state of embodied presence. Affective openness may be recognized as moments in which we feel 'moved' by a performance - or when an inexplicable sense of potential seems to emerge that transforms our habitual perceptions of time, space and subjectivity. This opening to affectivity is a double-edged sword. It radically de-centers the subject, but in doing so allows a sense of shared constraint to act like an intangible glue, connecting individuals and even nonhuman or inanimate elements within the environment. This approach is very different to other performance practices such as Ballet or Contemporary Dance, especially in the way specific methods deal with sensation and movement, form and intention, memory and the image. A performer may enact a sense of openness between selves and/or things when the boundary conditions by which these qualities are habitually expressed become tentative or indeterminate. Because of the importance of objects, artifacts, and built environments as ‘intermediaries’ within these performances, a comparison with theories of architectural diagramming and situated cognition provides a broader context for the research practice. In particular, I draw on a Deleuzian notion of ‘the diagram’ - not in the conventional sense of a design document but rather as an abstract device for generating processes of transformation. In working through the experience of developing my own performance practice, alongside theories of diagramming and affect, I develop specific principles and procedures for generating openness. I draw on my training in Butoh dance and Grotowski physical theatre method to consider how bodies and selves are affected by the way they situate themselves within a given site. Objects, artifacts, and built environments are seen to stand in as intermediaries for holding open a tentative disposition and through which collective shifts in affectivity may occur.